^ a b c Vittorio, Carli. “Darren Aronofsky Interview/Story”. Artininterviews. 2010年12月19日閲覧。 Undated; updated version of story from The Star, 1998, n.d.
^ Kenny, Glenn (2006-11-22). “The Fountain”. 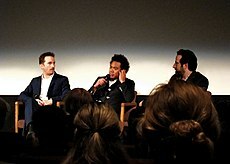 Premiere. オリジナルの2010年11月18日時点によるアーカイブ。. 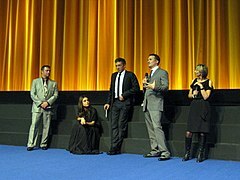 https://web.archive.org/web/20101118033252/http://www.premiere.com/Review/Movies/The-Fountain 2009年12月4日閲覧。. ^ "Direct Effect Season 1, Episode 7 Darren Aronofsky of BLACK SWAN". Fox Movie Channel Originals. TV Guide. 2011-10-11. ^ Vivarelli, Nick. “Aronofsky flies 'Swan' at Venice”. Variety. http://www.variety.com/article/VR1118023600.html?categoryId=13&cs=1 2009年12月21日閲覧。. ^ Boyd, Susan (2008). Hooked. New York: Routledge. pp. 97–98. ISBN 0-415-95706-0. ^ Booker, M. (2007). Postmodern Hollywood. New York: Praeger. ISBN 0-275-99900-9. ^ a b Powell, Anna (2007). Deleuze, Altered States and Film. Edinburgh: Edinburgh University Press. p. 75. ISBN 0-7486-3282-4. ^ Dancyger, Ken (2002). The Technique of Film and Video Editing. London: Focal. pp. 257–258. ISBN 0-240-80420-1. ^ "It's a punk movie". Salon.com (2000-10-13). Retrieved 2010-12-12. ^ Foley, Mick (2008-12-18). “The Wrestler Is Good”. Slate (The Slate Group). http://www.slate.com/id/2207076/ 2008年12月18日閲覧。. ^ Silverman, Stephen M. (2006-03-01). “Rachel Weisz has a boy”. People Magazine (Time Inc). http://www.people.com/people/article/0,,1185721,00.html 2011年3月7日閲覧。.